I am interested in having a hair transplant, but I don’t know how or where I should begin my research, how do I know if a doctor is good? It is important that the hair surgeon invest time and resources in the latest technology necessary for performing state-of-the art hair restoration. In addition, the surgeon should have a dedicated staff that are trained to use high-powered magnification tools and have the capability of transplanting a minimum of 2,000 grafts per surgical session, depending on the individual. It is important to select a surgeon with a strong online reputation. Since the early 2000’s hair loss forums such as the Hair Restoration Network Discussion Forum have become the best way for patients to interact with one another, share their experiences and post their results. A hair transplant surgeon with a strong online reputation has acquired credibility on their own merit rather than through marketing and advertisements. Consistent results require time and experience. Thus, the surgeon should have a dedicated, full-time staff assisting him or her. 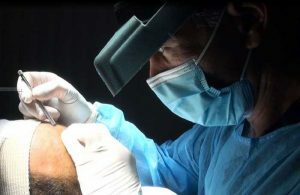 If the surgeon performs other cosmetic procedures aside from hair restoration, then the focus, effort and time necessary to produce ultra-refined hair restoration may be hindered as a result. Hair restoration is an intricate cosmetic procedure that can not be performed by any cosmetic surgeon, because the angle of the hair, density and overall appearance depends on the surgeons knowledge and experience to appear refined and natural. What’s The Difference Between Avodart and Propecia? What Happens If I Get A Hair Transplant, But Keep Losing Hair?